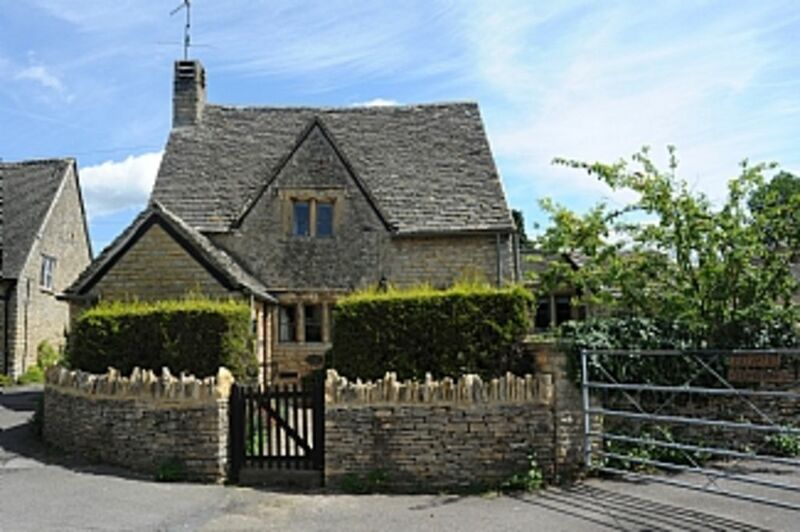 A Quaint Grade 11 Listed Detached Stone Cottage In Lower Slaughter with parking. Rose Tree Cottage in Lower Slaughter - An Idyllic, Quiet Cotswold Location Close To The River Eye and the famous Old Mill. Rose Tree Cottage is a quaint Grade 11 Listed detached period stone cottage nestling in the heart of Lower Slaughter with a large garage at the rear of the cottage for off road parking. Rose Tree Cottage overlooks the Old Mill and is only 50 yards from the River Eye making it an idyllic Cotswold location. It has a huge inglenook fireplace, stone mullions, Cotswold stone floors on the ground floor and central heating. Having been recently refurbished there is a new kitchen, bathroom and en-suite shower room. The front garden is enclosed by dry stone walls and hedges. The lounge/dining room has an inglenook fireplace with wood burning stove, a leather corner sofa and Laura Ashley chairs, oak furniture and an oak dining table which seats 6. There is a flat screen TV, DVD and music system. The Kitchen has wooden work tops, glass cabinets and butlers sink with an extensive range of appliances. The bathroom is downstairs by the lobby, with a full-size bath, high level toilet and basin with a shower over the bath. Finally on the ground floor there is a twin bedded room leading from the dining area with a small Gothic wardrobe and separate cupboard. Upstairs, there is a comfortable double bedroom with oak furniture and an en-suite with a large shower tiled with Cotswold stone mosaic tiles, basin and toilet. On the other side of the landing is the second twin bedded room with oak furniture. The decoration throughout is modern in style but the furniture itself is period design to give the cottage that authentic feel. Whilst we accept well behaved dogs for an additional cost of £30 per pet, per week or per short break stay, please contact us to check if you wish to take more than one dog. Weekly bookings commence on a FRIDAY only between April and the end of September. To change the commencement day at this busy time of year will make an impact on our other bookings. We do not generally accept short breaks during school holidays or between April and October, unless we still have availability much closer to the time. Short break prices are calculated on a percentage basis (not a nightly rate) taking maximum occupancy into account, e.g. 2 nights - 75%, 3 nights – 80% and 4 nights – 85% of the full weekly rate at that time and 5 – 7 nights will cost the full weekly price. Lower Slaughter is a "quintessential Cotswold Village" lying right in the heart of the Cotswolds. The River Eye runs right through the village with small stone bridges acting as crossing points. The mill has a gift shop and museum, riverside tea rooms and a working water wheel. Lower Slaughter Manor is a grand country house hotel in the heart of the village and Washbourne Court is likewise a charming riverside hotel offering a restaurant, bar menu and in the summer, drinks or tea at the Riverside Terrace. For shopping, Bourton-on-the-Water is a five-minute drive with the local supermarket situated en route. There is plenty to see in Bourton-on-the-Water e.g. Birdland Park and Gardens, The Model Village, Cotswold Motoring Museum and Toy Collection, Cotswold Perfumery, The Dragonfly Maze, Fundays Play Barn, Bourton Model Railway, Cotswold Pottery and Cotswold Farm Park. Also, in the locality are the villages of Broadway, Stow-on-the-Wold, Chipping Campden, The Slaughters, Stratford-upon-Avon and Burford. Other Cotswold attractions include Hidcote Manor Gardens, Painswick Gardens, Blenheim Palace, Kiftsgate Court Garden and Sudeley Castle. We are a small family business specialising in producing comfortable 'home from home' type holiday cottages in Cornwall, Devon and the Cotswolds. Each of our properties featured are owned and managed by ourselves. The benefit of this is that we know each property personally and this helps us provide a better service. Many of our guests return on a regular basis and some come by recommendation. If you are new to us you will find 'the team' to be efficient and helpful even to the extent of helping you to find the property that suits your holiday requirements best. It is important to us to provide a service of good quality and we are always happy to hear from our visitors with ideas or suggestions to help improve the service. The bathroom is downstairs by the lobby, with a full size bath, high level toilet and basin with a shower over the bath. The master bedroom has an en-suite with a large shower tiled with Cotswold stone mosaic tiles, basin and toilet. Notes on accommodation: The cottage has a huge inglenook fireplace, stone mullions, Cotswold stone floors on the ground floor and central heating. Having been recently refurbished there is a new kitchen, bathroom and ensuite shower room. The decoration throughout is modern in style but the furniture itself is period design to give the cottage that authentic feel. The north Cotswold village of Lower Slaughter is one of the most picturesque in Britain, and is known for its unspoilt limestone cottages in the traditional Cotswold style, built in regular fashion on either side of the River Eye. The stream running through the village is crossed by two small bridges and the local attraction is a converted mill with original water wheel selling craft type products and includes a cafe. You will find the Old Mill at the western end of the village, built in the nineteenth century, and last used commercially in 1958. The old mill museum which now has a tea room and gift shop is directly opposite Rose tree Cottage. Outside: The front garden is enclosed by dry stone walls and hedges and overlooks the old mill. There is room to park one car in front of the cottage and a second vehicle may be parked in front of our garage doors in the square behind the cottage. We literally just slept there and had a cup of tea in the morning. With the help of a local we found it. Then had to find the garage which was too small. The locals didn’t like us parking outside the garage (large car) so we had to find a road nearby. Next doors garden is right next to the lounge windows. Kept curtains drawn. Metal framed beds need tightening as they creak just breathing on them and being a nightmare sleeper I luckily found one that didn’t squeak all night. Lovely restaurants nearby that you can walk to. Only visited for two nights but it was perfectly adequate for our needs. It’s well furnished and decorated. great cottage for a family stay ! The cottage is fabulous and location is even better! We had a perfect 3 days. The cottage is much bigger than we expected. Very clean and had everything we needed. The kitchen is very well equipped with the added benefit of a dishwasher. The surroundings are beautiful with a mill and coffee shop immediately opposite that also sells a great selection of gifts, of which the owners were extremely friendly and if you have children they even offer a babysitting service for people staying at the cottage. Parking isn't possible outside of the cottage but its fine to load and unload there. The garage is a short walk away and you will need the directions to find it by car. It has an electronic door and is huge once inside and extremely secure. Thank you so much for the very favourable review. I am so pleased you enjoyed your stay and look forward to your return. Stow on the Wold - 3 miles. BRISTOL: Still an inland port with a canal opened in 1837 connecting the city ís docks with the Severn taking ships up to 1,000 tons. The best city panorama is from the top of the 105-foot Cabot Tower, which commemorates John Cabotís voyage to America. CHELTENHAM: Boasts not one but two famous colleges (one for boys and one for girls). CHIPPING CAMPDEN: Fine gabled stone houses advertise a wealthy wool industry with the 14th-century Woolstaplers Hall and medieval wool church. CIRENCESTER: Capital of the Cotswolds. LYDNEY: Roman remains and strong royal connections. NAILSWORTH: Charming Cotswold town built in a chasm. STOW-ON-THE-WOLD: Highest hill top town in the Cotswolds. The very large market square has stocks and a 14th-century cross. STROUD: At the forefront of England's broadcloth industry thanks to steam and canals. Billiard table baize cloth is still used to cover the worlds tables. TEWKESBURY: Timber-framed buildings predominate in this pleasing town with one of the finest Norman structure sin the country: Tewkesbury Abbey. A decisive War of the Roses battle was fought here. There is a strict NO SMOKING policy in the property. Booking Notes: Weekly bookings normally commence on a FRIDAY. Short breaks are only accepted from October – end of March. However, we will accept a short break booking in the high season, if we have availability close to the time. Short break prices are calculated on a percentage rate not a nightly rate. 2 nights - 75%, 3 nights-80%, 4 nights - 85% and 5 - 7 nights are the full weekly cost.